Sorry, but the Hurtta Padded Collar has been discontinued. Sorry, the Hurtta Padded Collar has been discontinued. Comfortable on the dog’s neck, a good collar is safe and easy to use. The safety and adjustability of padded collars make them an excellent choice for all dogs, including puppies. By distributing the pressure caused by pulling across a larger area, the Neoprene-padded Hurtta collar softens the stress placed on the dog’s neck and throat area. The ergonomic collar does not chafe the dog’s neck. Thanks to the safety lock mechanism developed for the adjustable collar, the stress caused by pulling is not placed on the clip buckle, improving the pulling strength of the collar. The new collar structure has allowed the extension of the padded section without compromising adjustability. I have 4 Great Danes and I have been using the Hutta Padded Collar for years and I love them they last a long time and the dogs don't mind wearing them, the only thing I wish is that you had more colors like you use to I would put a different collar on each dog so I knew which one went to what dog..I have told everyone how great these are..
Bought this collar from Leerburg well over a year ago and it still looks great. I especially like the design which ensures that there is no pressure on the plastic snap. (See Leerburg video.) Well-made product with the great Hurtta design. I'd purchase it again. I received a medium collar for one dog, and I have 'grown' to love it! :-). The reflective stripes are fabulous at night, and they are quite soft. I use it around the house/yard but I don't use it as my 'regular' collar. I then ordered a large..and yikes! 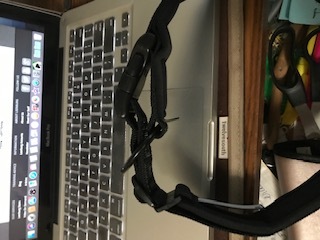 This collar seems to be made 100% different and doesn't work at all. The ring is in the wrong place, so it's impossible to work as 'slip'; it's not adjustable! It simply seems to have been a 'goof' by the manufacturer...or something? I have no idea. The collars seem a bit 'cheap' , but again, as I use the medium one, I am loving the fact that I have it. The large...no! If they have all been made this way..do not buy! (unless you don't want the 'slip' feature, then it should work. My 3 stars is ONLY for the medium size. No stars for the large.